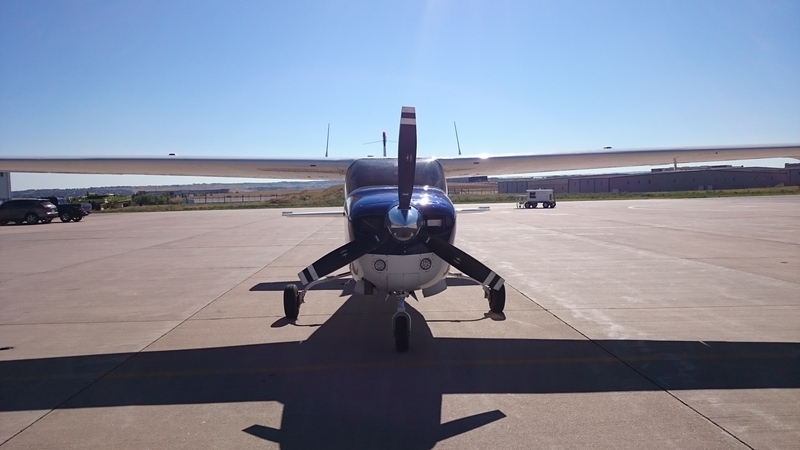 I flew a few hours in a Cessna Turbo 210. This plane asked for all my skills. To be honest, it felt as if I flew the first time all over again. The learning curve was steep and the airplane a thrill to fly. 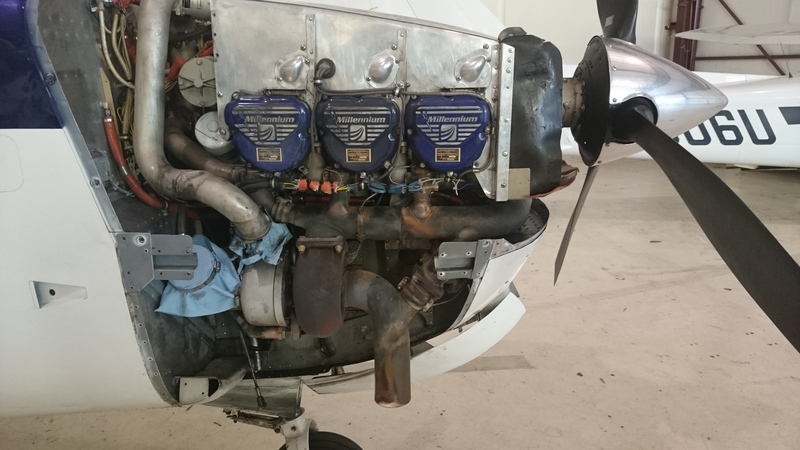 310hp 1978 Cessna Turbo 210 at Centennial, KAPA. At first sight, the aeroplane looks like the usual Cessna. But look at that sleek wing, the missing wing struts, the big cabin. This isn’t the usual Cessna. The first time I saw One Sierra Zulu, the cowling was open and one part in there makes all the difference: The turbocharger. At my homebase, Centennial (5’600ft msl), the density altitude is often reaching over 9’000 feet. This plane doesn’t care. The turbo pressurizes the intake manifold to 36.5″hg all the way up to 22’000 feet. The service ceiling is a staggering 28’500 feet. The panel of the T210 is a clean six-pack. I was nervous to fly this machine; I studied all its systems in detail and computed all numbers for my training flights. One thing kept getting my attention in the operating handbook. The mixture is left in the rich position during most operations (at Centennial a normally aspirated engine needs to be leaned hard for takeoff). But rich isn’t enough for this plane. To maintain the required fuel flow for maximum power the auxiliary fuel pump must be used. 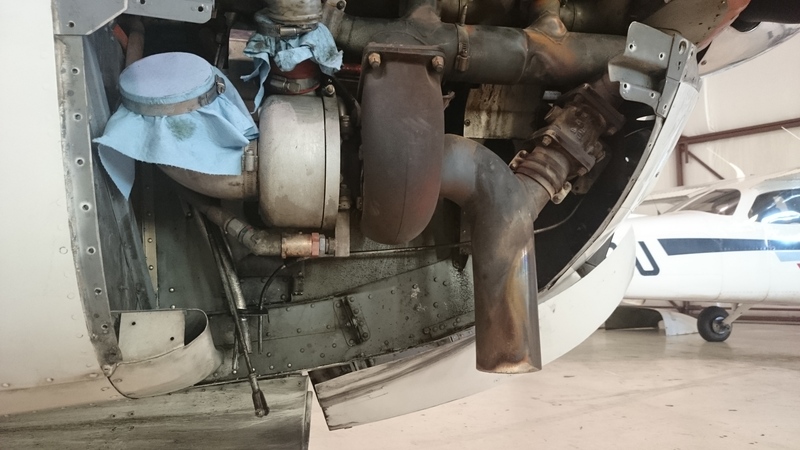 That’s probably why the fuel flow meter is so huge (right of the Garmin 530). The first takeoff taught me how much attention this engine needs. TSIO-520-R sideview with turbocharger and wastegate. I advanced the throttle slowly to attain 36.5″hg of manifold pressure, then realised the fuel flow had dropped. The engine roaring, accelerating fast, now switching the aux fuel pump on results in another power boost as the flow reaches the maximum on the gauge. I am all over the place, behind the airplane since I had let go of the brakes. But it is fun, it is exciting, it is a challenge. Now stop dreaming, confirm the ridiculous rate of climb and announce gear-in-transition, confirm the gear is up and reduce the power to 30 inches and 2600 rpm, fuel pump off. Turn on downwind, gear down again but anyways, we are way too fast. A bad approach leads to a bad landing they say. I don’t even dare to use the speedbrakes, even though they would probably help with my speed. With reduced power the plane sinks rapidly, I am too low during the entire final and the landing is nothing worth mentioning. I taxi off the runway for a taxi back. My instructor gives lots of inputs for the next round, but my head is already full of new experiences. This plane is a handful. My landings don’t improve during the next hour. The workload feels so high, I don’t have time for the basic flying anymore. I feel horrible, as if I had forgotten what I had learned during the last months and years. 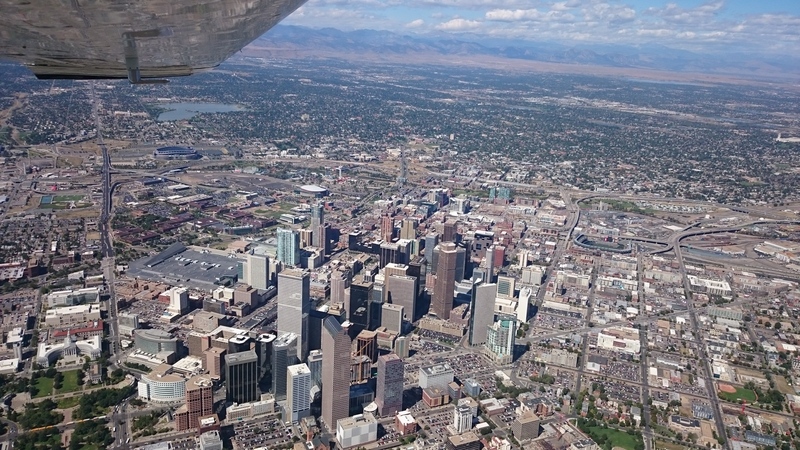 To get a feel for the plane, we go for a quick tour downtown and along the foothills. We reach over 180 knots ground speed, the ground is passing by fast. Straight and level flight is easy, I have no troubles keeping the plane within 50 feet. I fly orbits around Denver downtown at a standard rate turn. 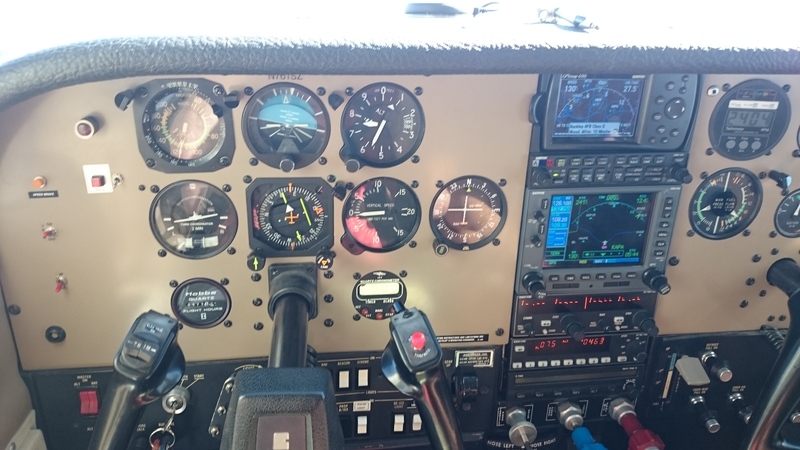 My bank is almost 30 degrees – during instrument training with the C172 a standard rate is about 16 degrees. The speed makes the difference. We are then heading back to Centennial and starting to slow down early. 5″hg per 5 minutes or 1″ per 1 minute is the rule of thumb to keep the engine from shock cooling. The cowl flaps are operated religiously by checking the engine temperatures every few minutes. We are calling Centennial Tower and our callsign “Centurion” sounds so much more serious than “Skyhawk”. And this plane is more serious. It doesn’t like me at the moment, I am too slow, my mind is far behind the plane. 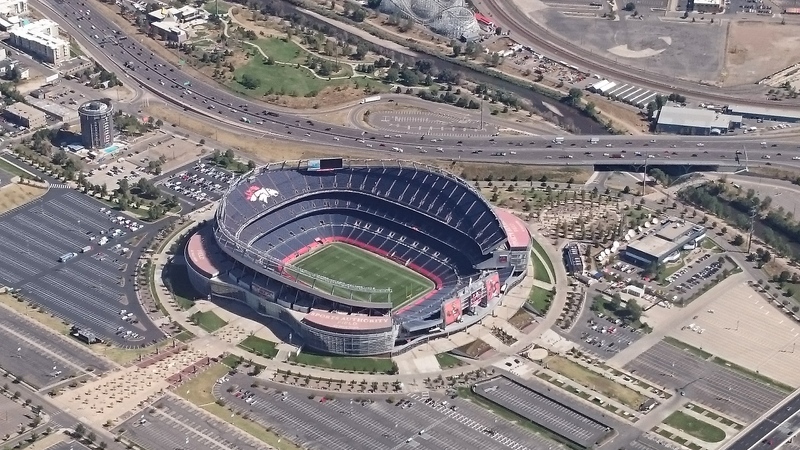 Sports Authority Field at Mile High – home of the Denver Broncos. After a quick lunch brake I sit in the 210 again. I pray that I had learnt something in the morning. I am not sure if I still deserve my certificates and ratings but let’s carry on. This flight must be better. We get squeezed in between a few business jets and we start our closed traffic for full stop taxi backs. Already the takeoff is smooth, I am much more organized and know what to expect. On downwind I reduce manifold pressure down to 15 inches to maintain 90 knots. I have time for my three GUMP checks and the landing works out just fine. My instructor jumps of joy, he must have done something right. My confidence is back. My approaches improve time after time, despite a 15 knot crosswind. Then the best landing of the day follows and we call it a day. Wow, I learned a lot today. What sticks in my head since then: Fly the numbers! Fly the numbers and you’ll be fine. 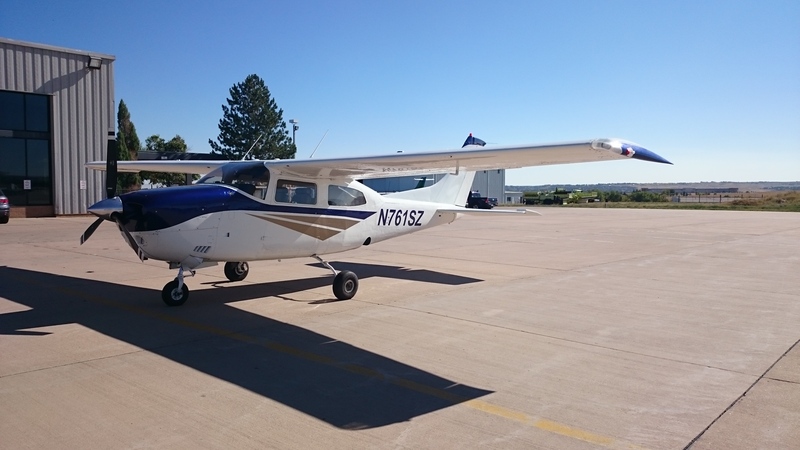 Cessna T210, beautiful machine. These wings!